The gadget blogosphere was on fire with iPhone 4G rumors over the weekend after Engadget posted photos of what it claims is the next-generation model of Apple's iPhone. How the handset, or at least photos of the alleged phone, came into Engadget's possession sounds like something out of a sci-fi mystery. A strange device falls into the hands of a regular citizen by complete chance and somehow makes its way to the gadget blog. The device works briefly but then mysteriously shuts down (perhaps by remote wipe), unsure what to make of the device gadget sleuths from across the Internet work together to try and uncover the mysteries surrounding, what we will call iPhone X. Is it the real deal, or just more baseless Apple rumor blather? UPDATE: Gizmodo recently posted a detailed review of iPhone X claiming to have had hands-on experience with the device. Engadget on Saturday posted photos that are supposedly images of the next-generation iPhone model, typically dubbed iPhone 4G, but for our purposes let's call it iPhone X. The gadget blog claims it came into posession of the photos of iPhone X after an unnamed source found the device lying on the floor of a San Jose bar. The phone supposedly has 80 GB worth of storage and a front-facing camera. Engadget also said the device is no longer booting up, but it was, and was "running an OS that was decidedly new." 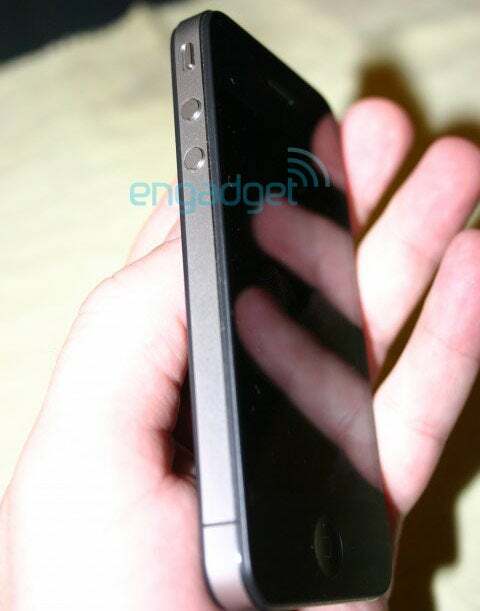 Engadget's photos also bear a striking resemblance to photos posted to Twitpic in February by Twitter user TUDream. The pictures show a a very boxy-looking, non-unibody handset casing with a variety of buttons and ports that correspond to locations on the iPhone: two buttons for volume (as opposed to the current one-piece volume rocker) on the left side of the device; a silent ring switch above the volume controls; and a sleep button and headphone jack at the top. The most convincing features, however, are what look like an exact replica of the iPhone's home button and earpiece. You can also make out in one of the photos a hole next to the earpiece that might be a front-facing camera; however, the photos are not clear enough to know for sure. Shortly after Engadget posted the photos, other sites, pundits and critics quickly denounced the photos as fakes. Apple prognosticator and Daring Fireball blogger John Gruber, who has a fairly good record at predicting new Apple devices, called the photos a hoax. Chicago Sun-Times tech critic and onetime Macworld contributor Andy Ihnatko posted a thoughtful piece on his blog arguing that iPhone X was most likely a Chinese knock-off of the iPhone; however, Ihnatko left the door open for the possibility that the photos were genuine. One of the most important points Ihnatko raised was that it seemed unlikely, given Apple's well-known addiction to secrecy, that a new iPhone would even be allowed to leave Apple's Cupertino campus. A particularly enthusiastic MacRumors commenter also got in on the action by posting a photo holding Engadget's iPhone X and claiming it was an iPhone knock-off he had bought in Japan. That rumor lasted for a few hours before it was revealed that the commenter faked the photo, opening up the possibility once again that Engadget's photos were genuine shots of the next iPhone. There was also some doubt about Engadget's claims that the device would no longer boot up, but this is hardly a surprising feature for an iPhone test unit. Apple began offering with iPhone OS 3.0 a Remote Wipe feature that lets you remotely delete any data contained on an iPhone, so it would seem likely that Apple would also have the capability to remotely shut down a test device in case it was lost or stolen. Despite the criticisms, Engadget stuck to its guns and later made a particularly interesting argument supporting its iPhone X claims. Looking over past leaked photos, an Engadget editor discovered a device that looked similar to iPhone X in a previously posted shot of the iPad. The iPad photo showed Apple's latest device bolted to a table, and sitting on top and to the right of the iPad were handsets that may or may not be the same as iPhone X. The problem is the iPad photo is very blurry, and making out the similarities between iPhone X and the iPad handsets is difficult. Engadget also claimed anonymous sources later confirmed to them that the blog's photos were in fact legitimate. These sources also reportedly said the next iPhone will take microSIM cards, just like the iPad, and will also have a higher-resolution screen and a better rear-facing camera with a built-in flash. Engadget also linked to more photos on MacRumors taken from a Chinese Website that show iPhone parts that bear some similarities to iPhone X. There are differences between the spare parts and iPhone X, but Engadget argues the discrepancies are to be expected since these are test units and not the finished product that will launch to consumers. With Engadget convinced its photos were genuine, Daring Fireball's Gruber claimed to have done some calling around to his own Apple sources and is now convinced that iPhone X is indeed the next-generation iPhone. However, Gruber also believes that the casing may just be for testing to disguise the device, and that when the new iPhone is launched it will probably look physically different. But the device would have similar specs including the front-facing camera, higher-res screen and better camera. Interestingly, the Macrumors photos and the Twitter photos from February show what may be a glass-like back case for the iPhone. A glass casing doesn't make much sense since it would be easily breakable; however, a Daring Fireball reader dug up this Apple patent from 2006 for a highly-durable and scratch proof ceramic (zirconia) enclosure that is radio transparent--meaning the new rear casing is meant to improve the iPhone's radio signal and would not be so easily shattered. It's not clear what to make of all this. We have a January photo from Engadget that may be showing iPhone X alongside an early test model of the iPad at an Apple test center. There is also this patent for a ceramic casing, which supports -- but hardly proves -- that the back casing seen in some of the iPhone X photos could be real. But one problem with Engadget's claim is that the iPhone X photos from Saturday never show the device facing front, so it's hard to tell for sure if the iPhone home button is truly the real deal, or if that hole next to the earpiece is actually a camera. What do you think? Are you buying the claims that this is the new iPhone?